Do you have acne scarring but plastic surgery is out of the question? No need to worry. While you may not get Dr. 90210 like results, items available in your own kitchen can help improve acne scarring if done correctly. 2. Nurture your skin with collagen and moisture building foods so that your skin can more rapidly repair itself. If your acne scars dark, you can use lemon juice to lighten them. Cleanse your face with lemon juice. Dab one teaspoon of lemon juice into a cotton ball and smooth it over the acne marks. Leave for ten minutes, then rinse. Use caution with lemon juice because it can make your skin photosensitive. So be certain to use a sunscreen on any area you treat with lemon juice prior to going out into the sun. Exfoliate your skin with baking soda. Often times a version of baking soda is used in cosmetic microdermabrasion treatments. You can give yourself a mini microdermabrasion treatment by mixing one teaspoon of baking soda with the two teaspoons of filtered water. Then gently rub the mixture on your acne scar for sixty seconds then rinse it off. After exfoliating your skin with baking soda, massage a pea-sized amount of olive oil onto your face. Acne scaring can cause the skin to lose its elasticity and suppleness. The moisturizing nutrients in the olive oil will penetrate the skin to deeply moisturize the skin and soften the skin's texture. In addition to eating fresh fruits to supply your skin with collagen building vitamin C, you can also smear them onto your face for gentle acid exfoliation. Just puree a forth a cup of pineapple and smooth it onto your face. Leave it for 10-15 minutes, then rinse. Since the pineapples contains ascorbic acid, it will impart a brightening effect on the face, and help fade acne marks. It cannot be said enough. "Your skin needs water." Especially when you want to promote the type of skin repair needed to heal acne scarring. Your skin needs water to keep the skin plump, to remove toxins, and the build new skin cells. Drink at least 80 ounces of filtered water a day to give your skin the quality and quantity of water it needs to reveal healthier, fresher skin. The ultimate ingredient needed to completely remove acne scars is consistency. Acne scars form over a series of weeks, layer by layer. To remove the acne scarring, you need to use your acne home remedy on a daily basis to remove the damaged scar tissue layer by layer. 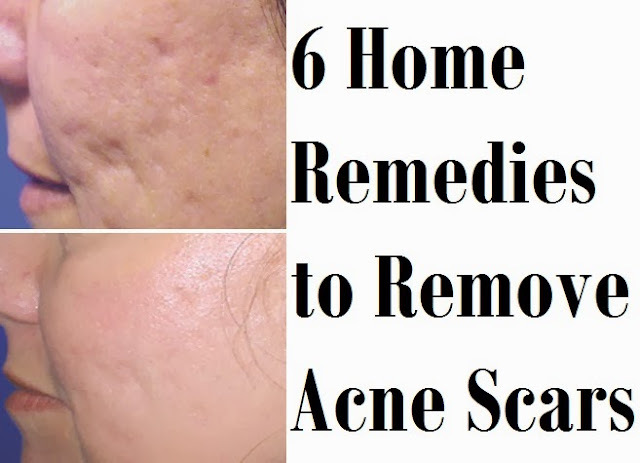 To be successful at fading and healing your acne scars at home, you just need to plan in advance. Devote time to removing the damaged skin and giving yourself the nutrients you need to build healthier skin. For example, you can decide to spend five minutes a day exfoliating your skin with baking soda or pineapple and another ten minutes enjoying collagen building foods like soy, grapes or oranges. Do it consistently and you will see and improvement in your scars.